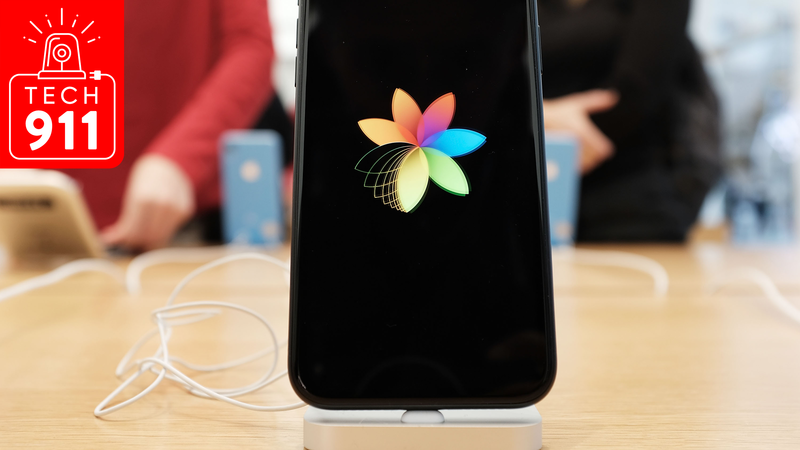 Though weather forecasting is a notoriously inexact science, thanks to voice assistants, pop-up notifications and buzzing smartwatches, it's easier than ever to keep tabs on the day's weather (and dress accordingly). 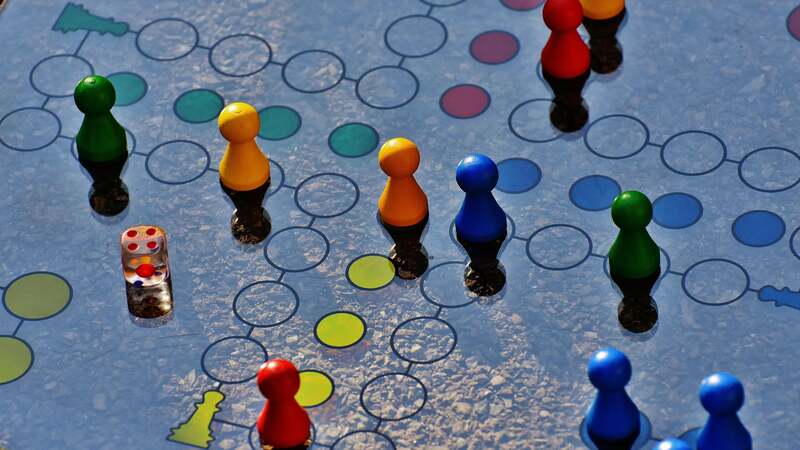 Of course, checking the truncated weather forecast on your phone might be convenient, but it could also mean you're losing out on valuable information that could help you deal with the heat, rain, or general mugginess outside. That's where desktop weather apps come in. 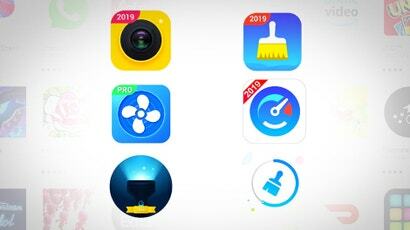 While you might be overwhelmed with the number of weather apps in the Mac App Store or Windows Store, only a handful are both beautiful in presentation and rich in data. Here are the best ways to check the weather from your Windows 10 or macOS computer. 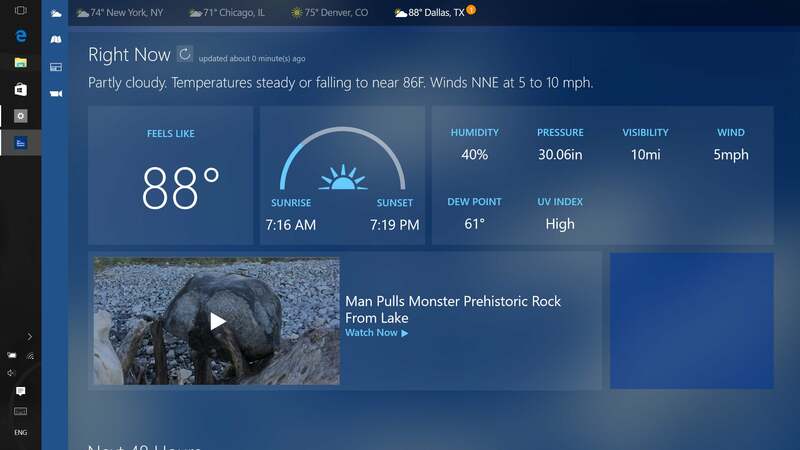 Windows 10 includes its own free weather app, MSN Weather, and it's not bad. It benefits from Windows 10's customisable live tile feature, which displays updating information about your local forecast at a glance when you check out your Start menu. That means you don't have to open an app to see the weather, you just have to hit the Windows key. MSN Weather presents the current forecast, along with the projected summary of the next ten days. Information like visibility, dew point, and barometric pressure is also included. You can look at a satellite view of your region to see any upcoming storms, or observe recent weather patterns. In addition, MSN Weather shows you a ton of additional information designed to appeal to paranoid amateur meteorologists. You can make note of sunrise and sunset times (perfect for finding the golden hour for photos), and get a sense of what to expect thanks to the inclusion of historical precipitation and temperature data, informing you of the likelihood of rain on a particular day over a 30-year period. 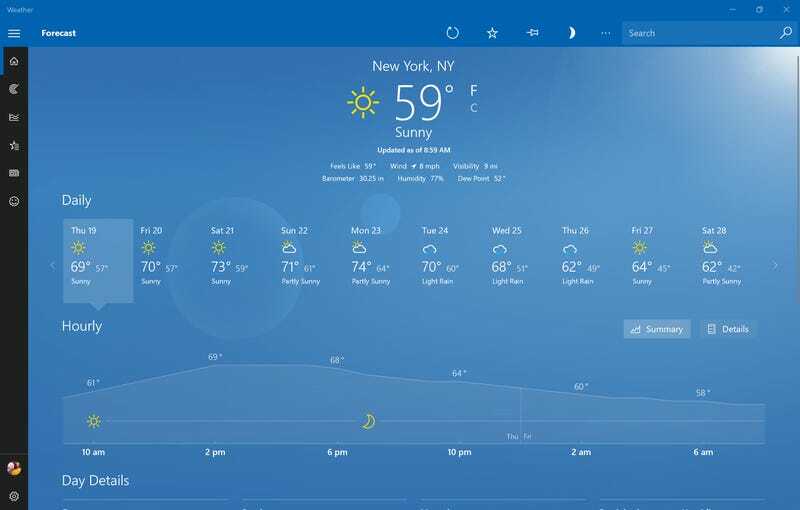 The Weather Channel's free Windows 10 app might appeal to allergy sufferers more than weather buffs. It includes the same weather forecast information you'd find in MSN Weather, and supports the same customisable live tile feature. The Health section shares information like tree, grass and weed pollen estimates, as well as flu activity. 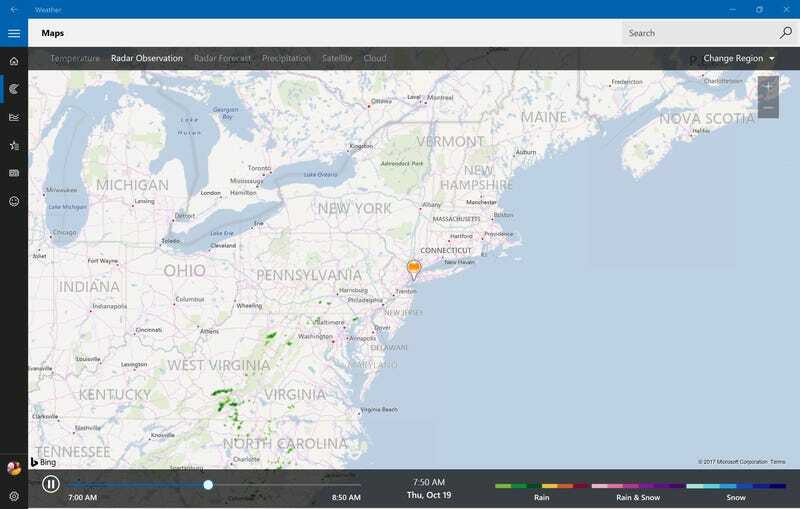 You can also configure The Weather Channel to send you pollen, rain, or severe weather alerts based on your location, convenient if you're one to forget to ask your PC yourself. That feature alone might be worth a look. It isn't the prettiest app, however. It displays today's forecast in a big bold display, but forces you to scroll down to get at other important information, and allows unrelated news articles to take up precious space. While Windows 10 has a robust built-in weather app, macOS isn't so lucky. There's a weather app that displays the general forecast in your notification centre, but it lacks the information needed to get a sense of the coming day or week. If you want a more convenient way to get your weather info, along with more weather information in general, Forecast Bar should be the app to go for. 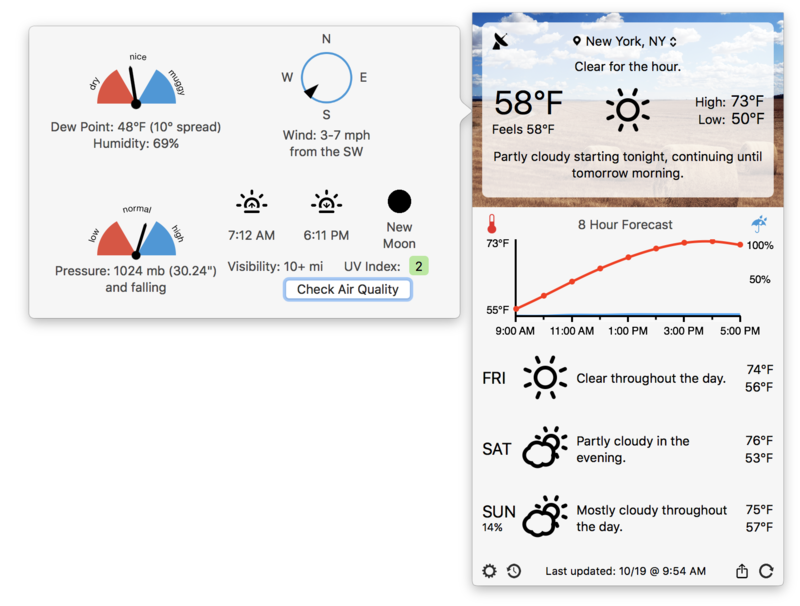 We've written about Forecast Bar in the past, and still think it's one of the best weather apps for your Mac. It lives in your menu bar, and provides tons more information than your Mac's default weather service. You can have your weather data presented in the dock or menu bar and see animated forecasts based on weather data provided by Dark Sky. You can see information like sunrise and sunset times, historical weather patterns, humidity, dew point and more. The app's also easy on the eyes, making it a great addition to your Mac app library. At $US9.99 ($13) it's a bit pricey and additional in-app purchases are available to increase the frequency of weather updates (Forecast Bar updates hourly). Even so, if you're tired of getting rained on, Forecast Bar might be the weather app you need to stay dry.